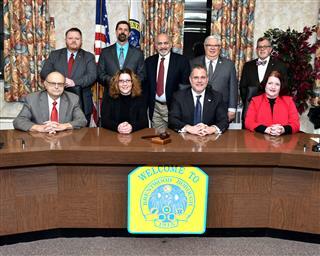 The Brentwood Borough Council is the governing body of our community. As representatives of the electorate, Council works to transform the will of the public into Borough policy. Council has the authority to pass local law in the form of ordinances, as well as to render administrative decisions, such as the adoption of the budget and the approval of service contracts, through resolutions. Membership consists of seven civically-minded individuals who are elected at-large by Borough citizens for staggered four-year terms. Brentwood Council general meets twice per month for a public session. On the third Monday of each month, Council formally adopts the agenda for the regular meeting. Regular sessions are held on the fourth Monday of the month. The Council Chambers are located on the second floor the Brentwood Municipal Building at 3624 Brownsville Road. If you are interested in attending a meeting but require a disability accommodation, please contact the Borough at (412) 884-1500 at least five days prior to the hearing.